OCM Recycle West and United Brokers Group are Recycling for Charity, specifically the Care Fund. Bring your used/unwanted electronics to the Chandler Office (106 S Kyrene Rd, Chandler, AZ) or Mesa Office (1166 E Warner Rd, Gilbert, AZ) at the dates/time listed on the flyer and help support families with seriously ill or injured kids!! !Type your new text here. 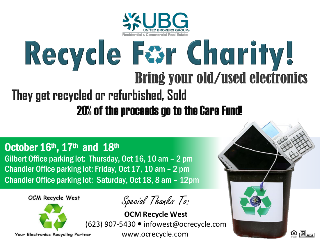 For more information, call or email OCM at (623)-907-5430, infowest@ocrecycle.com. OCM Recycle has applied for a Chase Mission Main Street Grant. Chase issues 20 Grants, nationwide, every year for $150,000 each. This is a great program, and OCM Recycle hopes to be able to participate. 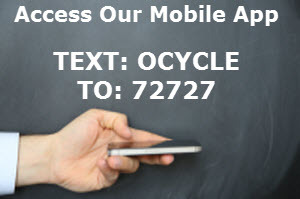 Please vote for us a www.facebook.com/ocmrecyclewest, click the link box with the Chase Mission Main Street logo, and it will direct you where to vote! We appreciate your support! OCM Recycle West proudly joined the Chandler Chamber of Commerce in September. OCM hopes to continue building its community presence by joining the Chandler Chamber and looks forward to interacting with the Chandler Chamber of Commerce members. 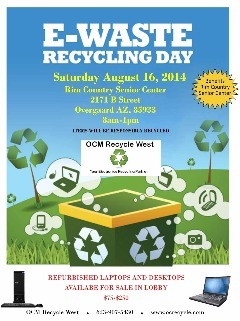 OCM Recycle West will be at the Rim Country Senior Center in the Heber-Overgaard area on August 16th. We're collecting old electronics, such as computers, printers, monitors, cell phones, etc., and will be selling refurbished computers at great prices! The e-Waste drive will benefit the Rim Country Senior Center, with the donation of updated computers and monitors for their seniors to use. We're very excited to be in the Heber-Overgaard area and hope you'll come out and support the event! Memorial Day Sale this weekend in Tolleson, May 23 3pm - 6pm and May 24, 9am - 1am. 10% Discount with Military ID. 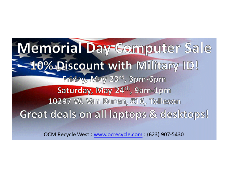 Great deals on Laptops and Desktops! Stop by and see us. 10297 W. Van Buren, #16, Tolleson.